After the second training on chicken breeding for disabled people came to a successful finish, COMPED HOME project is organizing the third training again on chicken breeding for disabled people, the expert chicken trainer from CeLagrid organization. Nine trainees were selected from different provinces, (Kandal Province, KompongSpoeu Province, and Kompong Cham Province). The theoretical training course is for two days focusing chicken breeding, the training is held at the COMPED HOME Model Farm for disabled people. Before starting the lesson, all trainees have to take part in a pre-test examination concerning their knowledge of chicken breeding based their own experiences and make group for discuss about problems/obstacles and opportunities of chicken breeding. For this purpose they are being supported by Mr. Phiny (CeLagrid Trainer). The training also teaches the trainees the correct way of mixing market food with vegetables and other feeding stuffs, such as earthworms, insects and termites. These kinds of food are high in protein which is an important requirement for successful chicken growing. After the training, the trainees will stay at the COMPED HOME Model Farm for disabled people for two months, before they come back to their homeland. 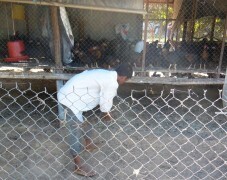 While staying at the COMPED HOME they have been practicing their knowledge that get from training in chicken farm at COMPED HOME directly. When the trainees back to homeland, all of them get a lots knowledge and experience of chicken breeding both, so they can start own business about chicken breeding at their each homeland. The chicken breeding can be a change for a better life for disabled people and the chance to enrich their lives with new opportunities and skills. Besides the skill of chicken raising, the trainees has learned the basics of small scale business from the experts of the National Center of Disabled People (NCDP). The trainers have providedsimple knowledge to the trainees that make them understand easily. The lectures show them the way how to reinvestment in small business and solve the problem of business process, and key to successful on business such as offering many suggestions and ideas to trainees about small scale business; about investments on chicken farm; about starting chicken farm and details of chicken farm requirements for example like “plan, human resource, investment capital, and materials for built chicken cage”;and how to control the finance to invest and execute on business. 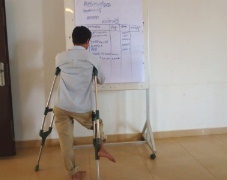 During the training session, the participants have chance to practice in the fundamental conduction for safety checking raisingand exercise in business plan and management.This fact enables them to make the best of their business and helps them to have a proper plan for their income generation for their change of life.